Pen to Paper is an independent stationary shop in Brighton’s North Laine, selling, as the name suggests, ‘everything you need for good old-fashioned pen-to-paper-type writing‘. Discreet black Moleskine notebooks sit next to colourful Clairefontaine pads and breath-takingly beautiful journals from Paperblanks. They’ve selected pens from Lamy for contemporary good looks, superior German engineering and an affordable price. You can find ink in thirty different colours and if you love traditional letter-writing, you’ll love their writing paper, tissue-lined envelopes and red sealing wax. Browse their greeting cards and find something to suit all personalities, from the humorous, to the artistic. 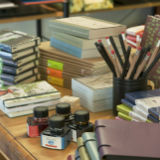 Pick up some beautiful pens and a notebook, it’s guaranteed to cure even the worst case of writer’s block.